In a mixing bowl spoon out the sugar, salt and pepper then zest the limes into the mixing bowl and mix together. Measure out the vodka and pour into the bowl and stir thoroughly. Lay out two overlapping sheets of cling film and place an additional sheet of baking paper in the middle. Then place the salmon fillet on top of the baking paper and spoon over the curing mix but make sure that the fish is completely covered. 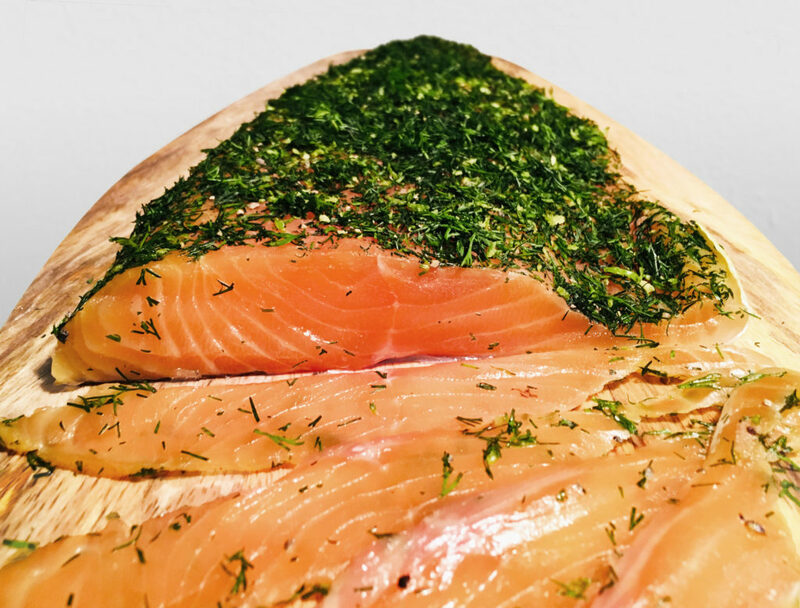 Wrap the salmon in the baking paper like a parcel then tightly wrap in the cling film and place into the fridge (on a tray just to be safe) and place a chopping board on top weighed down by some tins. Take the fish out after 48 hours and gently rub off the cure then pat dry. Slice into the desired thickness and serve. After the first 24 hours, take the fish out and gently remove the cure then pat dry. Roughly chop a bunch of dill and mix together with x1 tbsp of ground black pepper and 25ml of Arbikie chilli vodka. Place the new mix on top of the salmon and wrap back up as before, weigh it down and leave for the additional 24 hours. When ready, there is no need to remove this additional cure so just slice and serve.